I've described Hink Pink previously in The Book Chook Bag of Tricks. It's such a great game for kids who like riddles and are learning to rhyme, but I still enjoy it as an adult as a game to while away long car trips. NB The Annie's Rhyme Time link no longer seems to be working. Googling Hink Pink or Hig Pig will bring you lots of hits, however. Recently I discovered Scholastic have an online way of playing this game which they call Annie's Rhyme Time. 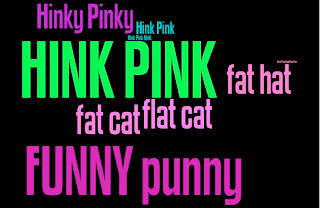 You get a clue - what I call a Hink Pink or Hinky Pinky, depending on how many syllables the answer has - and you must type in the two word rhyming answer. Kids can also submit riddles. It's a neat idea, but the problem is in both the browsers I used, some longer clues are cut off. If you want some to try with your kids, rather than clicking through to the next one each time, you can try the riddle index to see which ones are not truncated. If you're not thoroughly confused, here are some Book Chook riddles which you can answer in comments if you like. Games like this are a wonderful way to introduce kids to crossword puzzle clues, particularly cryptic clues. They tap into children's love of rhyme and fun with words, and give them an opportunity for some creative thinking. Win-win-win! We've always called this game 'Stupid Cupid'. it is one of our family's favourites on long car journeys along with 'I'm thinking of an animal'. Such fun both of them. Please come back and tell us what schnekker means! I know it must be funny, and am dying to understand why! Cherub number 2 was up most of the night so you're going to have to give me the answers to these! My big cherub has started talking in rhymes (perhaps all the spike milligan we read) and she thinks it is hilarious. Green Mama, that means brain fog plus, so I can see where you need consideration! Hope you get at least a nap today. Here's a starter: overfed feline is a fat cat. For your big cherub, "a puss with a big tummy" might be a more appropriate clue. Gathering of crocodiles is a croc flock. Too hard for a youngster. Here's a better one for a cherub: " a green puppy that jumps into the pond" (frog dog). The tricky thing for kids and adults is to realize that the answer will not be an exact one. A puppy is not exactly the same as a dog. Brainstorming rhyming words is often a good way to start. Okay, Jeanne has revealed that is it "schnecker" and it means a nose. I totally learned that these are ink pinks but the premise is exactly the same. I use them a lot for studying vocab words and reviewing their meanings. It gets really dynamic when students can make their own! http://eslcarissa.blogspot.mx/2012/07/rhyming-word-game.html Glad to see other people love them too! Such a great way to keep lessons fun and make sure students' brains get a workout. @Carissa PeckThanks for chiming in Carissa. Great to meet someone else who sees the benefits of rhyme!